Epson LABELWORKS PX is innovating industrial labeling with better cost and time savings features. The K-Sun Corporation, creators of the Labelworks product, had recently been purchase by Epson, a major corporation in Japan. 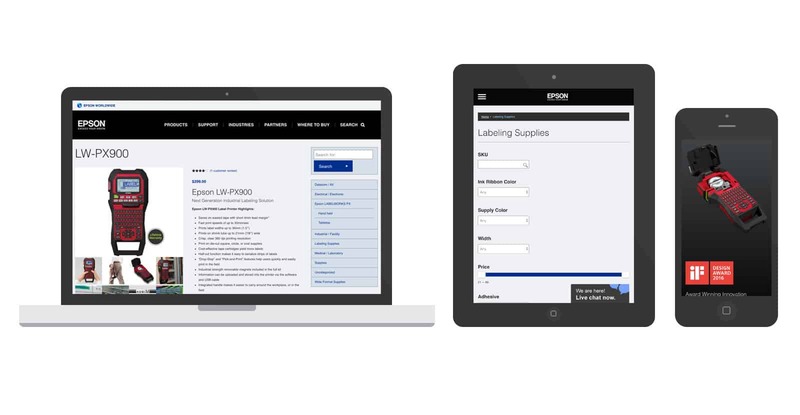 As part of the purchase, Epson requested they create a new website, using the updated branding guide, falling in line with the rest of the products and technologies they owned. K-Sun reached out to Spark Logix Studios, hoping that our team could balance the Epson branding guides with their desire to remain a unique product. What they didn’t want, was a templated site that was boring, and looked like every other site out there. We were happy to help! Our team took the branding guide that Epson had provided, specific fonts and colors that needed to be used, and added a custom spin to the layouts, ensuring that Labelworks were able to keep their unique feel and style, and making sure that the user experience was leading their customers down the correct pipeline, and purchase the products they are looking for. Another wonderful e-Commerce website, that will help the Labelworks team expand their market, and continue to grow!